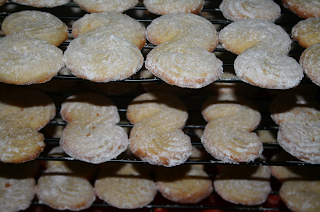 Some of you may recall the LEMON SNOWBALL COOKIES I was making during the holidays. I used the same RECIPE but substituted orange juice and zest (from our orange tree) for the lemon juice and zest. I also swapped out the pecans for macadamia nuts and topped them with chocolate instead of icing. Oh and instead of rolling them into balls... I used my icing decorator as a make shift cookie press and made them into "S" shaped cookies. So you see, they really are the same but different. I think I will call these Orange Zesties. These are so good I danced around and squealed with every bite! Think orange Milano's, but much better since they are homemade. 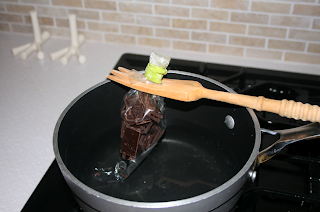 I am also taking this entry as an opportunity to show you how I prepared the chocolate for the drizzle effect. I used an icing bag, but a plastic one instead of a a plastic coated cloth one. You could also use a zip lock type bag as well. Just as long as the bag you are using is sealed at the bottom corner(s). 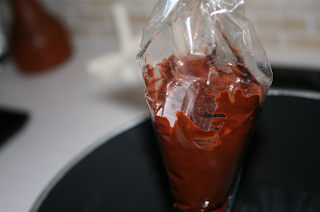 I like doing it this way because I do not have to melt the chocolate in a pan then pour it into the bag... which saves me from spilling it and makes one less pot to wash. I used dark chocolate candy bars... because I had them on hand and I melted the chocolate right in the bag. I used 2 regular size Hersey Bars for a double batch of these cookies (about 7 dozen) and had just enough. See below for my secret technique. 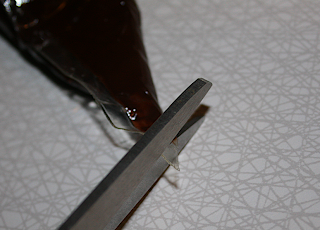 I place the chocolate in an icing bag and seal it with a rubber band or twist tie. I then wedge the bag onto a wooden spoon which I use to float the bag in a pan of boiling water... actually it does not have to boil. I just keep it on low so the spoon will not burn hanging over the pan. As you can see, it works like a dream. 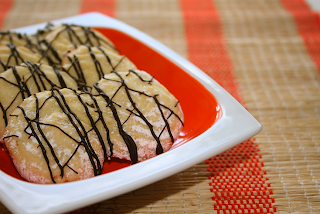 Make sure to dust with powdered sugar while still warm so that it stick. 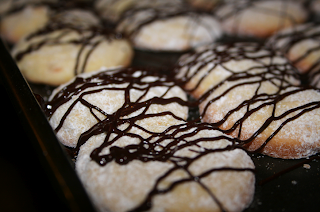 Then you want the cookies to cool on a wire cookie rack before you drizzle them with chocolate so it will not melt off. When ready to drizzle the cookies, cut a small hole in the corner of the bag. How big, depends on how thick you want your chocolate. Start with the smallest possible hole, then adjust slightly to your liking, because once you cute the hole too big... you're stuck with it. I like the thin stipes it creates with the small hole because I think it looks fancier than a big old globby mess. But it's gonna taste good no matter how you top it! Take all your cookies and lay them out on a cookie sheet once cool. 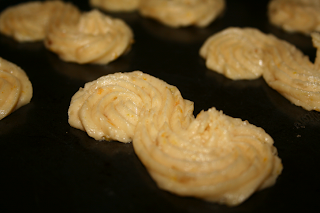 It's ok if they touch on the sides, that way you can drizzle a lot at one time. Now dig in!